This solution of the author’s motives is, however, offered as a mere conjecture. Whatever his views were, or whatever effects the execution of them might have, his work can only be laid before the public at present as a matter of entertainment. Even as such, some apology for it is necessary. Miracles, visions, necromancy, dreams, and other preternatural events, are exploded now even from romances. That was not the case when our author wrote; much less when the story itself is supposed to have happened. Belief in every kind of prodigy was so established in those dark ages, that an author would not be faithful to the manners of the times, who should omit all mention of them. He is not bound to believe them himself, but he must represent his actors as believing them. If this air of the miraculous is excused, the reader will find nothing else unworthy of his perusal. Allow the possibility of the facts, and all the actors comport themselves as persons would do in their situation. There is no bombast, no similes, flowers, digressions, or unnecessary descriptions. Everything tends directly to the catastrophe. Never is the reader’s attention relaxed. The rules of the drama are almost observed throughout the conduct of the piece. The characters are well drawn, and still better maintained. Terror, the author’s principal engine, prevents the story from ever languishing; and it is so often contrasted by pity, that the mind is kept up in a constant vicissitude of interesting passions. Some persons may perhaps think the characters of the domestics too little serious for the general cast of the story; but besides their opposition to the principal personages, the art of the author is very observable in his conduct of the subalterns. They discover many passages essential to the story, which could not be well brought to light but by their naïveté and simplicity. In particular, the womanish terror and foibles of Bianca, in the last chapter, conduce essentially towards advancing the catastrophe. It is natural for a translator to be prejudiced in favour of his adopted work. More impartial readers may not be so much struck with the beauties of this piece as I was. Yet I am not blind to my author’s defects. I could wish he had grounded his plan on a more useful moral than this: that “the sins of fathers are visited on their children to the third and fourth generation.” I doubt whether, in his time, any more than at present, ambition curbed its appetite of dominion from the dread of so remote a punishment. And yet this moral is weakened by that less direct insinuation, that even such anathema may be diverted by devotion to St. Nicholas. Here the interest of the Monk plainly gets the better of the judgment of the author. However, with all its faults, I have no doubt but the English reader will be pleased with a sight of this performance. The piety that reigns throughout, the lessons of virtue that are inculcated, and the rigid purity of the sentiments, exempt this work from the censure to which romances are but too liable. Should it meet with the success I hope for, I may be encouraged to reprint the original Italian, though it will tend to depreciate my own labour. Our language falls far short of the charms of the Italian, both for variety and harmony. The latter is peculiarly excellent for simple narrative. It is difficult in English to relate without falling too low or rising too high; a fault obviously occasioned by the little care taken to speak pure language in common conversation. Every Italian or Frenchman of any rank piques himself on speaking his own tongue correctly and with choice. I cannot flatter myself with having done justice to my author in this respect: his style is as elegant as his conduct of the passions is masterly. It is a pity that he did not apply his talents to what they were evidently proper for - the theatre. I will detain the reader no longer, but to make one short remark. Though the machinery is invention, and the names of the actors imaginary, I cannot but believe that the groundwork of the story is founded on truth. The scene is undoubtedly laid in some real castle. The author seems frequently, without design, to describe particular parts. “The chamber,” says he, “on the right hand;” “the door on the left hand;” “the distance from the chapel to Conrad’s apartment:” these and other passages are strong presumptions that the author had some certain building in his eye. Curious persons, who have leisure to employ in such researches, may possibly discover in the Italian writers the foundation on which our author has built. 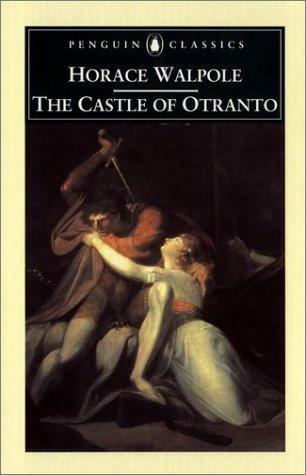 If a catastrophe, at all resembling that which he describes, is believed to have given rise to this work, it will contribute to interest the reader, and will make the “Castle of Otranto” a still more moving story. To draw the tear adown thy cheek? For weaknesses it never knows. For sure thy smiles are Fame. Turn on Word Verification for Comments to stop the spamming of this great work. I like the Idea of blogging a book! Nice but this isn't what a blog is! It works great for me on my website on guitar making. Took a bit of effort to convert the "Scribe" template but when it was done, it was a simple enough matter to make mods to several other templates to get the same format. I like it! Just great! Useful lay out for many publishing purposes. Thanks to the creator of the blog for describing how to do this. I will study this more later. The beautiful front of the book should be on top of the index page! The content list in the sidebar and footer is enough.